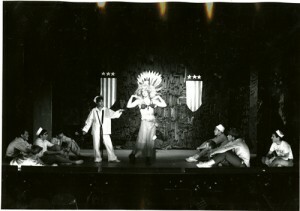 Charles Napier is pictured here as Captain Striker in 1984, click on the image to visit the official Charles Napier website, which includes images of his watercolor paintings. 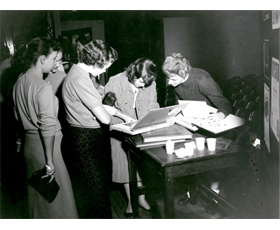 This photo from 1957-1958 shows women looking at a Western Players scrapbook, now in our collections, that was already 23 years old. It is now 80 years old. 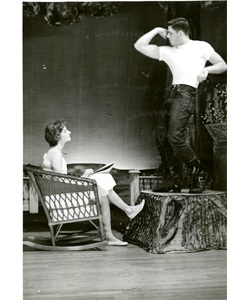 These fifty newly conserved and processed scrapbooks document theatre productions and other activities of Russell H. Miller and the Western Players from 1934 to 1969 and the Summer Players from 1956 to 1968. These scrapbooks include newspaper clippings, programs, tickets, greeting cards, correspondence, and many, many photographs.